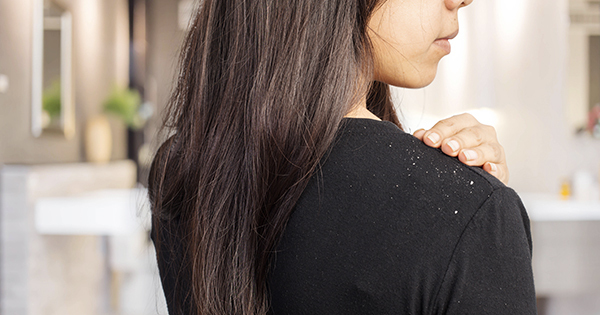 Dandruff is basically just excessive shedding. Old skin sheds and new skin takes its place. Sounds pretty normal, right? Just that with dandruff, it happens at a faster pace, so excessive skin sheds and becomes the reason you don’t wear black. There are some unsuspecting culprits behind this stubborn shedding. We’ve rounded them up for a cross examination here and have come up with some healthy hair tips for a clean scalp. There’s a long line of convicts that worsen dandruff like diet, stress and maintenance. But, the actual cause of it is a yeast like fungus called Malessezia. It’s usually harmless and lives in the outer layer of your skin, but it thrives on your scalp’s oils. Which is why it’s essential that there isn’t an excess of it. A Greasy Scalp Is A Hub For Dandruff! Grease helps yeast multiply. This irritates the scalp, leads to excessive skin cells shedding and those persistent flakes on your shoulder. Wash your hair often and don’t let any grime sit around on your scalp for too long. Usually, when your scalp is dry and dehydrated it overcompensates by producing excess grease. So, oiling your scalp regularly will take care of that, keep it clean, and keep the dandruff at arm’s length. You Are What You Eat. And So Is Your Scalp! Your dandruff loves cakes and cookies as much as you do. Sugary foods encourage yeast production in the body. They also deplete the vitamins that you need for hair growth. On the other hand, foods like garlic, onion and scallions with their anti-fungal properties help with the dandruff. Pro-biotics (found in homemade curd and fermented foods like idli, dosa or dhokla) help fight that yeast too. Basically, the best healthy hair tip is a wholesome desi diet! While air-drying is much better for your hair, make sure you’ve squeezed every last drop out of it, preferably with a muslin towel. Because, wet hair is a magnet for dirt and when combined with sweat, it’s just asking for trouble, in the name of itchiness and flaking. If you insist on blow-drying your hair, make sure you put it on a low heat setting and at a safe distance from your scalp. So, the only thing that is drying (and not frying) is your hair! Stress not only affects your immune system, it also causes your body to neglect your hair. With no immunity to fight it, the yeast thrives and causes dandruff. But don’t let that add to stress. Take a deep breath, keep calm, and carry on! Now that you know the actual causes behind dandruff, you’re better equipped to nip the excessive shedding in the bud. With these healthy hair tips, you’ll be back to wearing black in no time! The main culprits of dandruff are yeast and a greasy scalp. Hygiene and Hydration are the two basic healthy hair tips that are important for your scalp to keep the dandruff at bay. Eating certain foods, keeping calm and staying healthy also helps fight the yeast in your scalp.